The holiday season brings us together with family and friends, which can mean long road trips. While most of us enjoy the opportunity to travel, it can be hard on the body – leaving you aching and tired. You can find relief by stretching the muscles that tense up after hours in the car. Remember to stretch regularly throughout your journey to help your body feel less stiff and tight, to get your blood circulating, and to help you stay alert if you’re driving. Stop every 1-2 hours to get out of the car for a stretch or walking break. 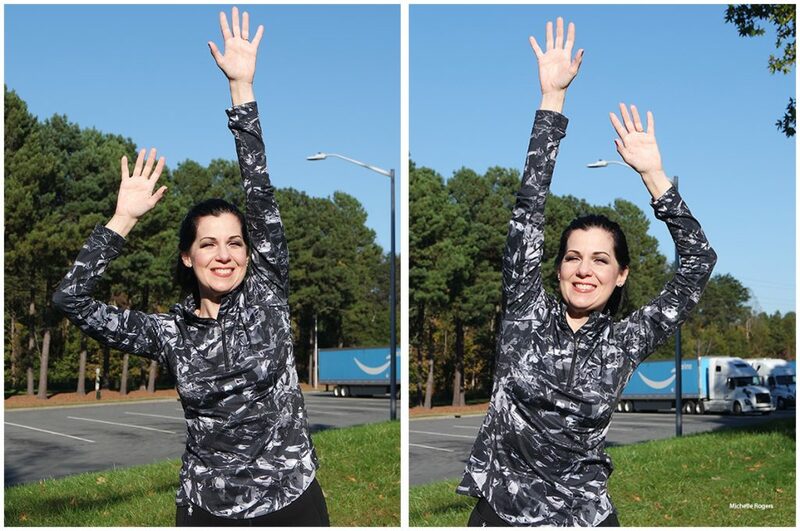 Here are some simple, beneficial stretches you can do for your back, hips, legs, shoulders, and neck. Important note: Only move through the range of motion that feels right for your body. Always check with a qualified professional if you have any concerns about what exercises are appropriate for you. Don’t stretch an area that is in pain; consult your health care provider to advise. Walking is one of the best exercises you can do. If you only have time to do one exercise, make it walking – provided that you have a safe place to do it. 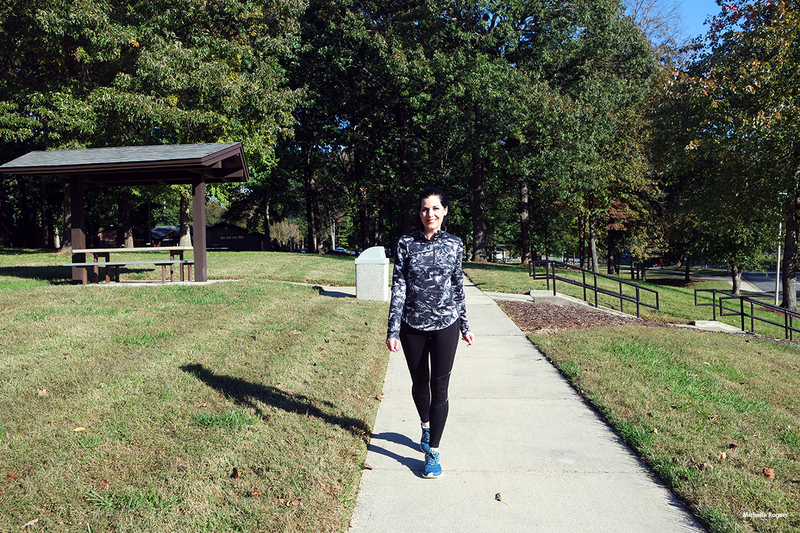 Most of the state-owned rest stops in North Carolina have paved walking paths or sidewalks. Many even have pet areas, and you can take a stretch break together. If you have time to venture from the highway, parks and trails provide a wonderful place to walk, along with fresh air and scenery. If you prefer to walk indoors, a shopping mall is a great option. It’s important to get out and walk on a regular basis while you’re on a long trip. It will help you stay alert and refreshed; stretch your legs, hips and back; relieve tension and soreness; help prevent drowsiness, and enable you to keep going for longer. Try to walk for at least 5 minutes, and longer if you can. But any amount you can do is better than none. When sitting for a long time, our hips, gluteus (backside), lower back, and hamstring (back of the upper leg) muscles become tight. Here are two stretches you can do using a park bench, picnic table, or the outside of your car. Michelle demonstrates how to properly do a hip and leg stretch. Hip and leg stretch. Stand a little away from the bench and put one foot on the bench into a lunge position. Slowly move your hips forward, keeping your lower back flat. Keep the heel of the straight leg on the ground, with toes pointed straight ahead. Do not bounce. Hold for 15-30 seconds. Repeat on the other leg. Variation: This exercise can also be done as a lunge without your leg on a bench. Michelle demonstrates how to safely squat while stretching. The squat. Stand with your feet hip-width apart. Bend your knees and slowly lower your body. Hold onto the bench, coming down as low as is comfortable for you. Keeping your arms straight and a firm grip on the bench, lean back until you feel a gentle stretch. Hold for 15-30 seconds. Slowly rise to a standing position. Repeat. Note: Avoid this exercise if you have knee problems. If pain is present, do not stretch. Michelle demonstrates stretching technique using a rest stop bench. Downward facing dog. This a standing version of the popular yoga move. Stand arms distance from the table or bench. Keeping your legs straight and knees soft, slowly hinge forward from your hips until your hands reach the table. Keep your arms straight and your neck and back in alignment. Hold the stretch for 15-30 seconds. Rise up slowly. This is one of the best exercises you can do for your back. Cat and cow. With your feet shoulder width apart, bend your knees and put your hands on your knees. Tuck your chin and round your back (cat). Hold. Then arch your back and look up (cow). Hold. Reach for the sky. Reach your arms up one at a time, reaching as high as you can, as if you’re grabbing onto a rope to climb. Repeat the back stretches 3-5 times. Do all of these movements slowly and gently, with care. Shoulder rolls. With your arms down at your sides, lift your shoulders up, back and down. Repeat several times. Head rolls. Look down and gently move your head from side to side, in the front only. Don’t extend your neck backward. Ear toward shoulder. While facing front, slowly tilt your head to the side. Hold a comfortable stretch for 5 seconds. Repeat on the other side. Be sure to stop every 1-2 hours to get out of the car for a stretch or walking break. It’s worth the small amount of time and effort. Your body will thank you.